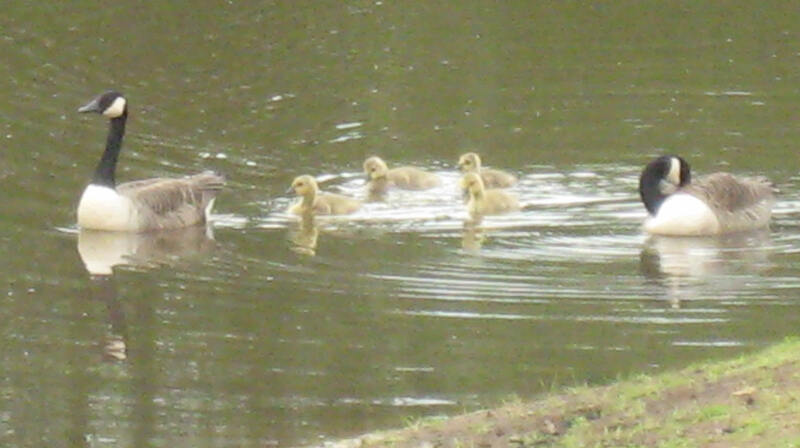 Head for Hoe Valley Park for a pleasant and easy stroll through green grounds near Woking town centre. 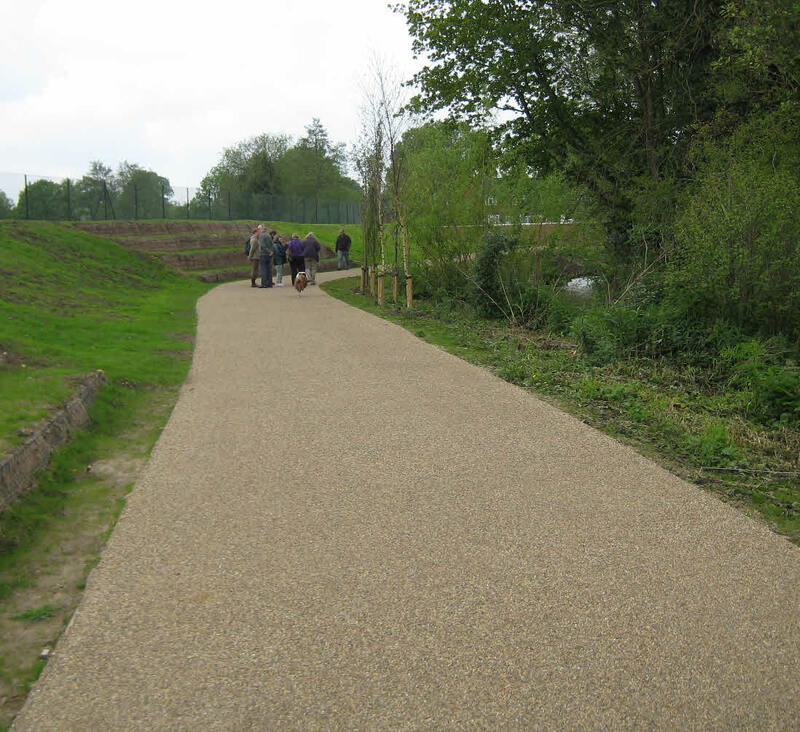 Its wide hard-surfaced pathways are ideal for walkers, cyclists and wheelchairs. The paths are level or have gentle slopes, so can be easily managed by wheelchair users moving under their own efforts. The landscaped park opened in spring 2012 having been created as part of the £44 million Hoe Valley Scheme. This reduced the risk of flooding that has blighted the area for years, and removed over 12 acres of contaminated land at the former Westfield Tip. 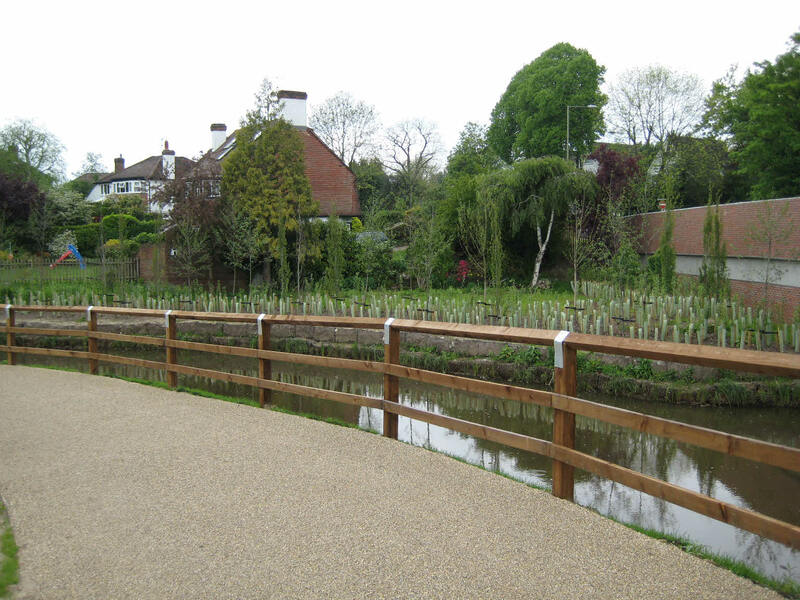 Flood protection measures include over 4km of reinforced concrete walls and earth embankments, as well as earth bunds to protect Westfield School. That sounds ugly, but clever landscaping makes the new park a delight to walk visit. For starters, nearly 1,000 saplings were planted and there was extensive grass seeding before the park opened to the public in spring 2012. The planners aimed to encourage wildlife to return to the Hoe Valley by creating ponds, meadowlands, bat boxes and habitats for water voles and greater crested newts. The start of the main path through the Hoe Valley. The brickwork on the right is Elm Bridge (carrying Kingfield Road). New sapling planting can be seen on the opposite bank. Return to Kingfield Road using the footpath/cycleway alongside the access road. Cross this road close to the junction, then cross Kingfield Road itself at the pedestrian crossing. Turn right and cross Westfield Avenue to take the path towards the stream, beside Elm Bridge. It took us about an hour to complete the route described below, which includes an indirect return path. The total distance isn’t far – about 1.5 miles (2.4 km) – but we took it at a very leisurely pace and stopped regularly to observe the flora and wildlife. The wide hard-surfaced path is ideal for walkers, cyclists and wheelchairs. The wide path terminates at a T-junction with a black tarmac path, near a play park. Here you can turn left and then immediately right past the enclosed play area to continue along another path, with woodland to your right and housing to your left. We presume this will eventually continue as far as Mayford but, when we visited in May 2012, it ended suddenly after about 150 yards. It’s necessary therefore to retrace your steps to the play park. From the play park you can either return to the starting point along the wide path by which you arrived, or follow the following, longer route which has short sections where the path slopes upwards and downwards (so wheelchairs will need pushing). Take the black path, with the enclosed play park to your left. A bridge crosses the Hoe Stream before you reach a road (Willow Way). There is a dropped kerb a short distance to your left, should you wish to avoid the drop onto the road at this point. Turn right and walk along the road, with the houses to your left and the parkland to your right; you will pass hard-standings for cars. Go along a stone-surfaced path on the right. This path follows the route of the Hoe Stream (crossing it on foot bridges) for much of its length. It therefore takes a much more winding route through the park than does the wider path used earlier and to which it eventually leads. When you reach the wider path, turn left to return to the start of the walk in Kingfield Road. Woking Leisure centre car park is off Kingfield Road (the A247). Bus routes 34, 462 and 463 stop near the start of the walk in Kingfield Road. Toilets and a café (serving hot and cold food) are available in Woking Leisure Centre and Pool in the Park, both next to the car park. These are operated for Woking Borough Council by Freedom Leisure whose website at www.freedom-leisure.co.uk provides details including opening hours for each venue.